RICHMOND, Va. (AP) Chris Thompson goes out for a pass route with his right leg on his mind. Eight months since breaking his right fibula, Thompson still thinks about it when running and making sudden moves. Now two days into his first taste of team drills at training camp, the Washington Redskins‘ 2017 offensive MVP is attempting to get over the mental hurdle of rehabbing from surgery and getting back to normal. Thompson became Washington’s secret weapon on offense with 39 catches for 510 yards receiving and four touchdowns to go along with 64 carries for 294 yards rushing and two touchdowns on the ground. It’s no coincidence the Redskins’ playoff hopes effectively ended when Thompson went down in New Orleans in November. Doctors put a plate and five screws in Thompson’s leg, and he considered the ensuing rehab more difficult than after previous surgeries to repair knee injuries. They told him he wouldn’t be 100 percent until a full year had passed, so it’s on Thompson to manage the pain, his own expectations and his progression along with the team’s training staff. The goal of the journey is being ready for the beginning of the regular season. 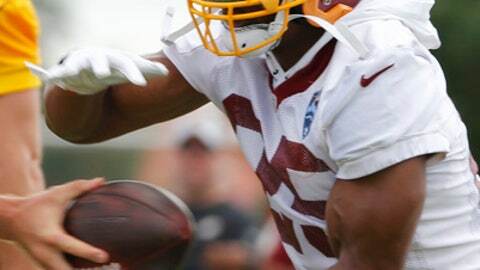 Coach Jay Gruden on Wednesday said he was confident Thompson would be ready for the opener Sept. 9 at Arizona. Gruden left open the possibility of limiting Thompson’s workload early in the season because the 27-year-old running back knows he’s not yet close to being back to himself. The sustained speed isn’t there, but teammates are glad to get a glimpse of Thompson working his way back. There are several steps left in Thompson’s progression, including no limitations in practice and then possibly some action in preseason games. The next milestone is getting hit by an opponent and seeing how he reacts. NOTES: WR Josh Doctson left practice after landing hard on his left shoulder while trying to make a diving catch. A spokesman said Doctson was being evaluated for a shoulder injury and that the team would have an update Thursday. In a since-deleted tweet on his verified account, Doctson said he’s ”just fine silly rabbit.” In another tweet, he said, ”(hash)imgood.” … WR Paul Richardson went down in individual drills but returned minutes later and made several catches. … S DeAngelo Hall announced his retirement at a formal news conference after playing 14 NFL seasons for the Atlanta Falcons, Redskins and Oakland Raiders.